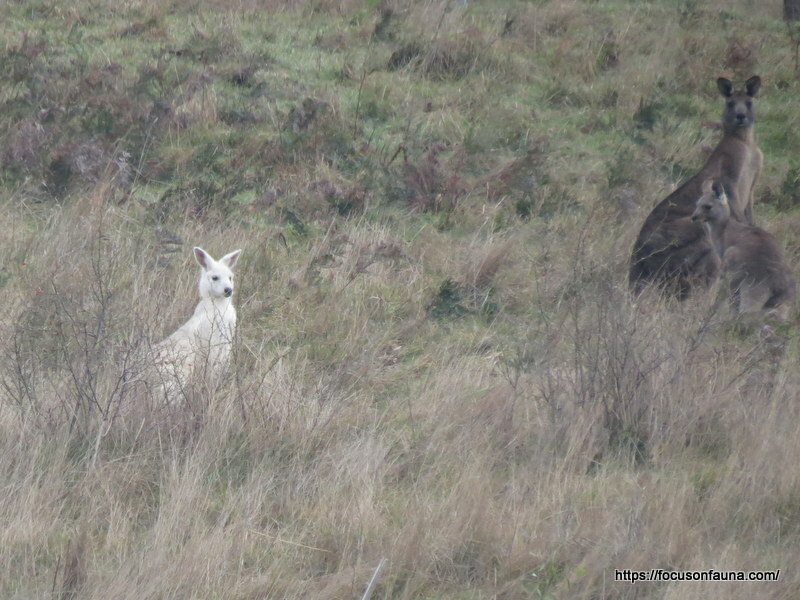 Following a tip-off and receipt of some grainy mobile phone photos, we decided to investigate reports of an all-white Eastern Grey Kangaroo on a large grazing property in the Flowerdale/Strath Creek area. With the help of the property owner’s son, after a couple of tries we were able to get close enough for some long-range photos. The roo seemed in all other respects normal and well-accepted by the rest of the mob, but of course stood out from a long distance away, presumably making it more vulnerable to predation. 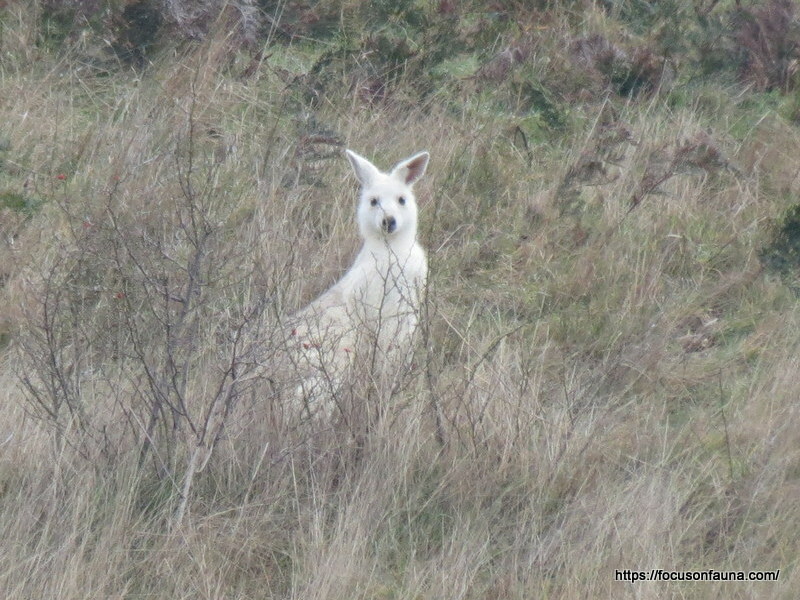 A white kangaroo is quite a rarity – an estimate by the Australian Zoo is 1 in 10,000 – but there are several reports on the internet of sightings in Victoria in recent years. 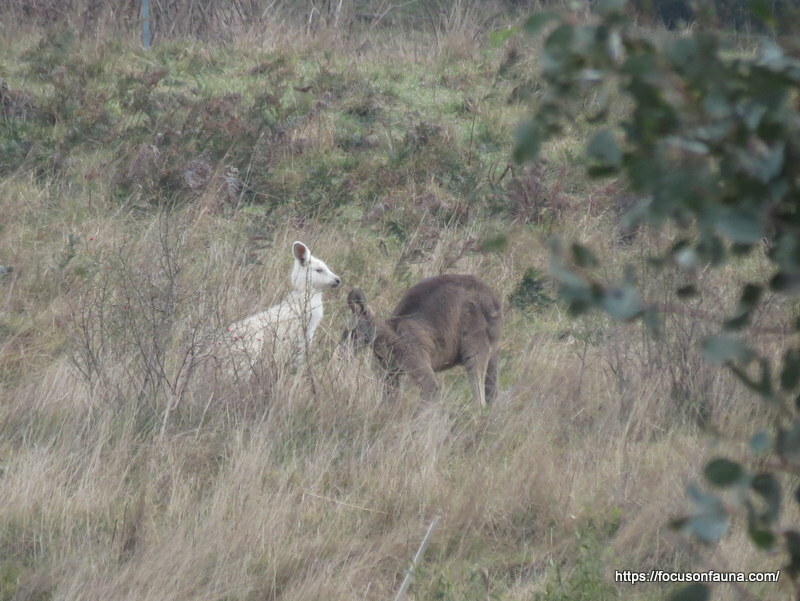 We came across one interesting article on a white kangaroo in an urban environment. It was a paper titled “The White Kangaroo” by Simon Watharow presented at the Australian Wildlife Rehabilitation Conference in 2016. Many Strath Creek residents will remember Simon from a wonderful presentation on snakes he gave at the Landcare AGM some years ago. In his paper Simon gives an explanation of the difference between the genetic anomalies leucism and albinism. He also suggests that one of the main threats to his kangaroo might be from humans keen to have a rare skin on their floor – which is why we’ve been vague about the location of this kangaroo. We have read reports of both pale grey and brown joeys as offspring of a pure white mother, and it will be interesting to see if this one, which we think is a female, produces a joey and what colour it will be? ← Coming to a fruit tree near you? Hope I get to see it if and when I can get down there Cecilia. It is beautiful.